big big smiles for you!!!! i want you to know, i’ve thought about you from time to time, hoping you were doing well and not too under the thumb of your spoons. also, we have a new puppy and i wanted to wiggle my nose so that we were in the same place and you could train me to be the best dog mom ever. be well….i love love love (probably a little too much) discussing pregnancy. you email me anytime. Thanks! Very excited :D Actually a birth center birth is planned, so basically the same thing but I don’t have to clean up afterwards, the best of both worlds! The spoons and I are managing, though baby is taking some of them for him/herself so I’m having to be more careful, which is why blogging has taken a sideline. But I’ve missed it, and now that I’m starting to get my energy back and can talk about what has been filling most of my mind I’ll be back here more. This post made me cry…I am so super happy for you. And the pumpkins with the soo soo? Love. Congrats!!!! How wonderful! Congratulations on such a happy event! And yes, the pumpkin picture is perfect, in fact, it’s my favorite that I’ve seen! You’re linked and best of luck in Trimesters 2 and 3! Congratulations. 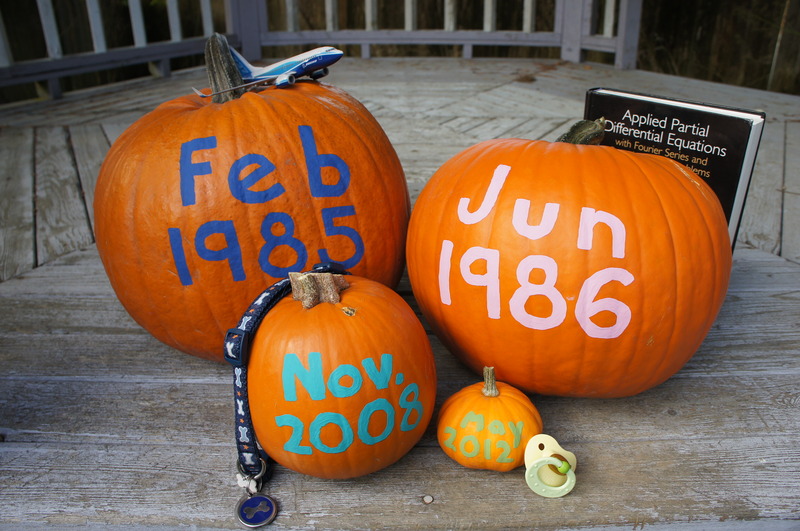 Love the last photo of the pumpkins with the dates. Very clever indeed. Welcome to the Spin Cycle.